Today Jeff Bezos launched the amazon kindle at 7:30 pm IST :). Boy'o'boy am I really excited. I don't wish to say too much, but it was just way way way way over expectations at our control centre. Do check out the videos on the device here - http://www.amazon.com/kindle. I find the possibilities endless. And I just can't stop thinking. A lot many of you may not be all that excited. But I've been around this device for little less than 6 months and its just amazing when I think of it in the hands of people and how it could impact our society in the years to come :). 1. Business men on tour getting their favourite newspaper where ever they go. No more missing out papers when you travel, no more search for where the news stand is. Wherever you go, your paper follows you ;). 2. Bloggers and blog readers on the move. Sometimes I've wished while I were traveling if I could catch up with some blogs. Wait until the kindle starts pumping your favourite blog and you can read it on the move. No PC Required! And who knows, maybe the device would also let you blog in the days to come :). 3. Voracious readers of books. I am the kind who reads books while traveling but I just hate carrying the bulky thing and having to bookmark where I left. The kindle is just IDEAL for that. Keep reading, turn it off, come back and it will take you to where you left. Something that I found was a big turn-off with PDF readers. And moreover, you can carry over 200 books in just ~10 ounces ;). 4. Students - With most of the kindle editions being priced at not more than $9.99 (which is how amazon would want it) this would be a great boon for students not having to carry tons of books or go through the painful process of reading from back-lit device. Although such books are not available for the kindle, I am blown away just thinking of the possibility of wide use of it in academic circle. I can go on-and-on but am short of time so I'll cut it down here and leave the remaining thinking to you. Maybe i'll stop with imagining a color display and also support for music in the background (so befitting for people who listen to music while reading :D.
The experience for us in the war room was exhilarating. It was like we were launching a space-shuttle and during lift off a piece of foam broke off. But then it was nothing to worry. And the rate at which the device was selling out was simply MINDBLOWING. The number of people requesting for their stuff to appear on the kindle was unfathomable. I hate to make a comparison of the kindle for IMHO it stands by itself in human history, but for the benefit of reader to comprehend its potential impact - Kindle will do to reading what the iPod did to music ;). Do comment your ideas as to how this could change out lives. Note: None of the opinions expressed here are those of Amazon or the people withing and are purely my thoughts on this ground breaking event. I haven't been been blogging lately and old readers may realize I don't make personal posts. But here I am making an exception coz I feel like and I want this on record for good. I finally get to know what it feels like to be d*****. Am probably saying quite a few things here out of agony and may not hold in due course. But it is today. For well over the last one year, I made a whole lot of sloppy decisions. Rather, every decision I took with confidence worked against me. I know I've said this many times before but this time another BIG decision goes up that list. This time its personal :|. Sometime I'v held onto for almost two years or more. I put others above myself. Not all, but those very close to me and it cost me a lot. People keep saying that todays generation is so self centric. What I do realize is you are taken advantage of when you are not self-centric. Not that I'd stop putting others above myself :). Thats who I am. I don't blame others at all. It was my fault. I never believed in other peoples pessimistic advice. But then this one turned out to be true. Nevertheless, I am glad that I fought it out to my ends :) not blindly going by it. I never gave up, i.e. until when I shouldn't have ;). I still don't buy that advice though :p for I never lost. I don't know as to what I did wrong :-?. I try not to keep too much faith / trust in people but every time I've made an exception, its turned out disastrous. Its so hard to correct one self when you don't know where you went wrong. Every time this happens I am every more hesitant to entrust in another :(. Am sure its a problem with me and not them. I hope I get to find that soon. Maybe it is true that dreams you have early morning do come true. A day or two back I had this dream where I start a day and I realize that all of a sudden something is missing in my life. Something that (I believed) meant to me more than anything else. I frantically searched, searched and searched but it just was not to be found. But what I considered most dearest was no longer there. Two days since then and it has come to be true in real life ;). Coincidence? Maybe I can see a world beyond time :D like Neo does in the matrix, he he. Or maybe I have begun to understand the choices and am able to see past them :p.
I feel so lost yet again. On the one hand I am so devastated and on the other its as if maybe this is a new chapter in my life when I have to let go of my past. I am smiling when I look at myself in the mirror, but its looks like a scorn from my other self :D as if he is saying "See, I told ya" in a wicked tone. I don't even know if I want/should be smiling or be glum. But on the bright side there ain't no indecision anymore :). Guess I've rambled enough out of frustration :D and bored my readers if any. But I really needed to vent this anger and not carry it into tomorrow, oops today :D.
Don't be surprised if you don't hear from me for long. Only way I see to get into grips is to burn out for a while which anyway is in queue. Hopefully December Season should make me write more :). Thats what life is these days for me. Let alone take a peak into blogsphere :(. But not taking a laugh reading those comic strips (dilbert / CnH) is just way too injurious :D. Shame on me. There was a time when not many Indian folks listened to western and music director who copied from them got away, at least for a long while. Looks like the industry has grown so commercial that there ain't much room for creativity :(. Likewise this song in Azhagiya Tamilzh Magan - Nee Marlyn Monroe's got the feel of Wannabe by Spice Girls, doesn't it? 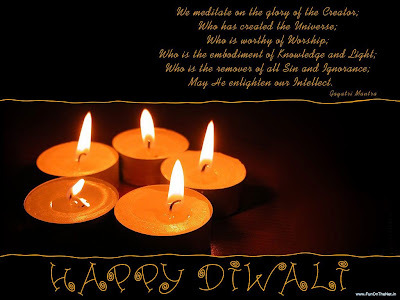 Wishing all of you a very happy deepavali. May the festive spirit bring in smile and joy in all of us.